Note: Originally published on the Anime Archivist blog February 2014. 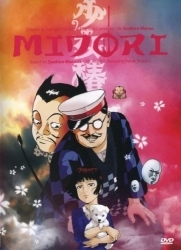 In early 1920’s Tokyo, a young girl named Midori is forced to sell flowers in order to survive. Her mother is deathly ill and her father has run off. Her world comes tumbling down when she returns home to find her mother dead and being eaten by rats. Midori is befriended by a middle aged man who says he will take care of her. However he betrays her and forces her to work in his travelling freak show. Not only does she have to perform on stage in an act where she bites the heads off chickens, she is routinely physically and sexually abused by the other performers. Her only escape is watching the trains go by and feeding a litter of abandoned puppies near a Shinto shrine. However the troupe’s fire eater, Kanabun, discovers what Midori is up to and viciously kills the puppies and cooks them in a stew for the other performers to eat. Coupled with her performances and the constant chores and abuse from her fellow performers, she seems to be slowly losing her mind. The troupe is deep in the red, but a salvation appears with the arrival of a new act; a dwarf magician named Wonder Masamitsu, whose signature trick is getting himself inside and out of a glass jar. He takes an instant liking to Midori and the feelings are mutual. Midori becomes Masamitsu’s assistant on stage and quickly becomes the troupe’s draw card. The other performers become jealous and begin to terrorise Midori again. However Masamitsu uses his magic to subdue them and even manages to get them to do Midori’s chores. But Uchisute, the performing armless man of the troupe, decides that he wants to be Midori’s lover and attempts to woo her away from him. Masamitsu discovers what is going on and kills him in a fit of rage. Midori witnesses the murder and becomes frightened of him, but he persuades her not to tell the rest of the performers. Masamitsu’s dominance over Midori reaches its limit when he angrily tells off a talent scout wishing to cast her in a film. Midori is furious at him. He retaliates by placing her inside his glass jar. Later that night at the troupe’s performance Masamitsu is heckled by the crowd. In a rage using his magic, he temporarily transforms the entire audience’s bodies into grotesque shapes, which cause some to burst and their internal organs to spill out. The dwarf has had enough and leaves the company with Midori in tow. Unfortunately for the troupe, the freak show’s manager runs off with their money. Yep, so this show isn’t exactly something you’d plonk in your DVD player and relax to. For many people it’s quite a challenging piece of work. The grotesque elements, the sexual violence and horror would quite rightly lead you to think that this film is nothing more than an exploitation piece. However the origins and the actual preferred presentation of the movie makes it something completely different. The origins of the original manga actually come from kamishibai story telling, where a story is told by a narrator using illustrated storyboards inserted into a stage-like frame. The storyboards are removed revealing the next picture in the story. Originally a tool Buddhist monks used to convey morals to an audience, the art form was revived and popularised in the early 1920’s before falling out of favour by the end of the 1950’s. During that time, the “Camellia Girl” was a common character that regularly featured in such stories. Her story in kamishibai was pretty much the same as presented in the film; a young girl from a dirt poor family goes from selling camellias on the street to an even worse situation of being sold and forced to perform in a revue type show. 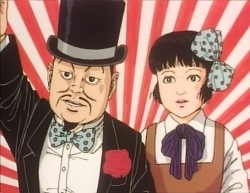 The film itself is not just a retelling of Suehiro Maruo’s manga. Director Hiroshi Harada decided not to just create the film and distribute it in cinemas as you would with normal film. Instead the film became part of a larger performance piece. I suspect this wasn’t the original intent. Harada could not find any one to fund the film, and with the subject matter a proper theatrical distribution deal would be pretty much impossible. The premiere of the film in May 1992 was held inside a giant red tent inside the grounds of the Mitake Jinja Shinto shrine in Tokyo. Inside the elaborately decorated tent, underground theatre group Aka Neko Za (Red Cat Theatre) performed stage acts similar to the freaks in the film. Fire eaters and other acts also performed. Later screenings/performances became secretive affairs with deliberately confusing flyers, cryptic signs pointing to were the performance was being held, and patrons had to enter through dark labyrinths before getting to the actual venue. 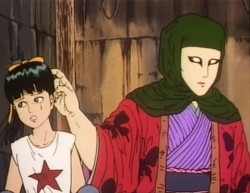 During the actual screenings of the film (performances by the theatre group were either side of it), the Aka Neko Za members would throw objects (as they were thrown onscreen in the animation) into the audience and even do live sound effects. When the film toured overseas film festivals (sans elaborate live performance pieces), promotional material had director Hiroshi Harada under the pseudonym “Hisaaki Ezu”, who was “currently missing”. The film itself had a long and drawn out production process. After being unable to secure any funding for the project, Harada, a story boarder for animation studios by trade, animated and funded the project himself in 1987. Amazingly Harada drew nearly all the 5,000 sheets of animation that make up the film himself. The project was finally completed in 1992 with the help of various people in the underground art scene including composer J. A. Seazer, whom most anime fans would be familiar with due to his distinctive work on the soundtrack for the “Revolutionary Girl Utena” TV series and movie. Due to the grotesque imagery and sexual violence in the film, 26 cuts were required by Eirin, the Japanese censorship board. Despite that, the original print of the film was later confiscated and destroyed by Japanese Customs at Narita airport after it had returned from an overseas screening. Despite the fact that the director to a large degree deliberately made the film incredibly difficult to view, somehow French video distributor Ciné Malta managed to obtain the rights to release it on DVD in 2006. Luckily it includes English subtitles, as well as French, Spanish, Italian and German. Either Harada or Ciné Malta wanted to make this film accessible to as many people possible. This release flies the face of the fact that Harada has for more than a decade flat out refused to release the film on video before, especially in Japan. The DVD comes with a number of features including an insightful interview with Harada, a very comprehensive look at the Japanese performances pieces which involved the film, and a 16 page booklet, in both French and English. The easiest way to get the film is from Amazon.fr. However occasionally stock can be hard to come by. Again, this is another title I have chosen to highlight that is extremely difficult to recommend to others. In fact it is on the very extreme scale of that; I don’t think any other title I have ever written about in the past or will so in the future is as difficult and challenging for viewers as this one. The first problem the film looks like a straight up low budget exploitation piece, even if you know the origins of the story. Most people wouldn’t want to sit through 49 minutes of a prepubescent girl being physically and sexually abused by a bunch of carnie freaks, animal cruelty and death, and exploding bodies amongst the other horrors it portrays, and all of it animated in a very limited and somewhat scrappy looking style. The film in this format is also divorced from the larger performance piece which I think is a problem as it was never really designed to be seen outside of that (despite the fact it has toured many film festivals). It’s also a film that I think requires a little bit of knowledge in regards to kamishibai story telling to full appreciate it. The supplementary material on the DVD does not provide much in terms of educating the viewer about this either. Overall perhaps this film really isn’t a title you can recommend to fans of anime. It most certainly has never played to an “anime crowd” and it certainly wasn’t the intent of the director. However if you are interested in alternative animation (and this film is definitely on the fringe of that) then this is a title that may interest you.